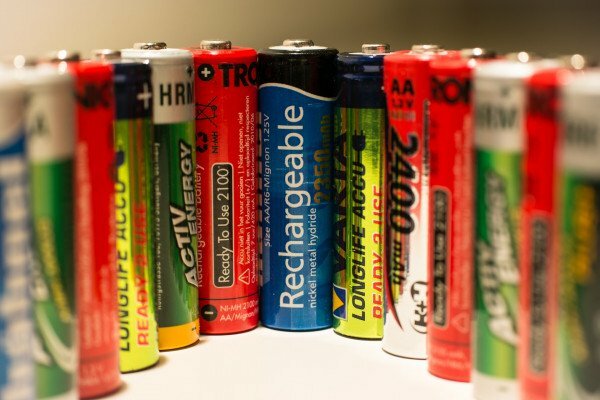 Why do some batteries last longer than others? Part of the show What do worms do in the rain? Why do some batteries last much longer than other less expensive brands? And are different types more suitable for certain applications than others where the savings would not be as great? So, actually, you have two halves of a chemical reaction: one which absorbs electrons and another that gives them out. And the only way that the chemical reaction can carry on is when these electrons are going around and getting back to the other side through your circuit and they can do work when it's doing that. Now, there are lots of different chemical reactions you can use and so, basically, the number of atoms - the number of molecules which can be active or which can move electrons across is important. The more you can get in the battery, the more current, more charge you can store in the battery. So, you've got to have lots of complex things that hold it together, which take up space and take up weight - and, normally, it's only on the surface where these things can react. So, any kind of centre of an electrode which isn't able to react with things is useless and doesn't work very well. So, basically, the way they last longer is by having more of the battery, which is active; you can do different chemical reactions which can store more energy, take up less space. You can also use different chemical reactions if to produce different voltages. So, a lithium ion battery is at 3V whereas a standard one and a half volt alkaline cell is 1.5V, and a rechargeable battery is 1.2 volts. Different batteries have different properties. Alkaline cell will last for a very, very long time. It doesn't lose its charge. It could just sit back and it will last for several years. It has a shelf life of several years. Whereas a rechargeable battery will just discharge itself in maybe a month or so. Also, a rechargeable battery can give out much more current. So, if you've got a high current application, a rechargeable battery works a lot better. So, yes, there are different circumstances where some are better than others. Next How do some orchids mimic insects? What chemical leaks from batteries? Can we use waste nuclear heat to generate electricity?